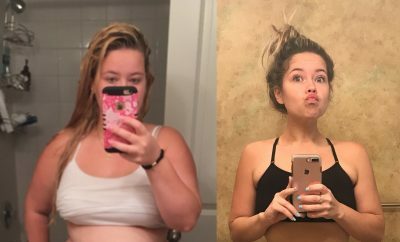 Hayliemonster went from a size 16-18 to a size 0-2 by integrating many different types of exercise into her life such as yoga, pilates, walking, spin classes and circuit training. She says that this variety keeps things interesting. One of her biggest learning experiences was portion control. It shocked her to learn what a food guide portion actually was in comparison to what she was really eating. 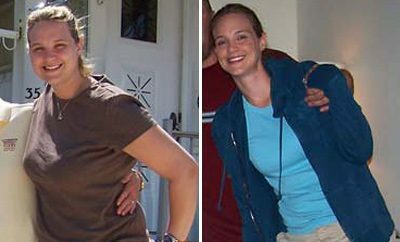 With all these changes she has successfully lost 100 lbs and is living her life to its fullest. I was going out to dinner for my husband’s 30th birthday and literally had no clothes that fit. I decided then and there that I had to do something about it. So that night at dinner I started and I have never looked back. Weight Watchers, Jenny Craig, exercise, limiting diet. I changed everything. In small steps of course. I used to be a sedentary couch potato and now I am active every day. I never cooked and could eat out for all of my meals before, and now I plan and make almost all of my food at home. I eat whole foods, no artificial sweeteners, lots of fruit and veggies, and food high in fiber. 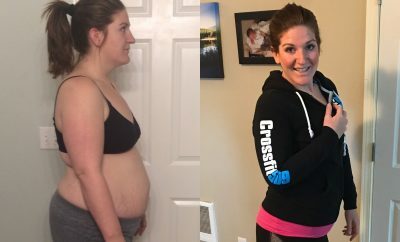 I used to feel that in order to be fulfilled I had to eat food that was unhealthy, and my mantra was that I would rather be fat and happy than skinny and unhappy. I now know that everything is about moderation. I discovered Calorie Count when I was transitioning into maintenance. What really helped me was the community feel to it, and in the forums other people who were having the same challenges as I was. Life! 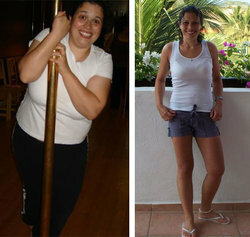 It is very easy with just a little bit of willpower to cut calories and eat to lose or maintain weight. It is fitting life into the equation that is difficult. Birthday parties, going out to dinner, the eating that isn’t as easily controlled. Also it was reaching my goal. I had never lost weight to the point where I actually reached my goal before. With diets I had always given up before I got there. It was a really big challenge to switch to maintenance. Almost immediately. I lost 20 lbs in the first month. Other people started noticing after I had lost about 40 lbs. That took a long time. Probably this summer when I went to Mexico and wore a bikini for the first time in my whole life! I still count my calories, I still limit eating out (once a month), I splurge on a special treat that I really want and have learned to incorporate that into my eating style. I exercise daily. I think that the biggest part of maintaining is that I lost weight as the byproduct of changing my lifestyle, so now there is not the temptation to return to old habits just because the weight loss part is over. I am a completely different person. I have energy, I am active, I am healthy. I can enjoy life to its fullest! Change your lifestyle, don’t go on a diet. Take small steps and re-evaluate where you are at once a month. Incorporate exercise in some form, no matter how small. anything can be altered to make it a healthy choice.